Two robbers armed with machetes escaped with £2,000 in cash after threatening staff in a Sheffield shop. They struck at the Premier store on Buchanan Road, Parson Cross, at 9.30pm on Thursday, May 10. 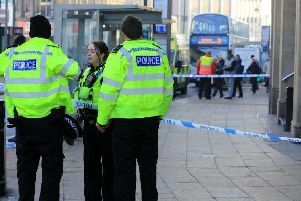 South Yorkshire Police said that in addition to the cash, the robbers also stole a quantity of cigarettes. A force spokesman said: "Two unknown offenders entered the Premier store on Buchanan Road brandishing machetes. "Threats were made to the staff and the offenders left with £2,000 and an unspecified amount of cigarettes."